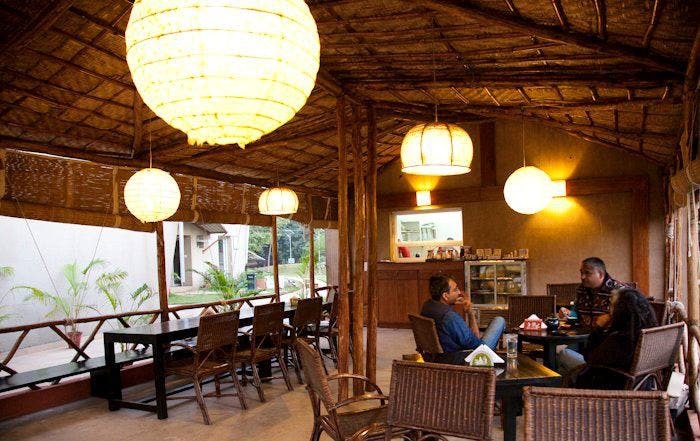 For those looking for the best restaurants in Gurgaon to satisfy those hunger pangs and beer cravings, here's a big list of restaurants and bars you should definitely try once. You're bound to find one you'll keep going back to. It doesn’t matter if we live by the coast or not, the option of fresh seafood is an exciting reality. Amaranta specialises in providing the full coastal experience, and their most exclusive offering is the Catch of the Day. Crab, lobster and fish – brought in fresh and cooked to perfection. The only Brazilian eatery in town, the chef here specialises in the churrasco style of food, and upon request, will carve your meat out for you at the table. It’s one of those experiences that you must have once in your life, and Wildfire provides it, no problem. They have a line-up of 12 meats (chicken, lamb, prawn, pork – to name a few), all grilled. With the bright neon signage and lit torches surrounding the pool, you’d think you’re in Ibiza. The bar nibbles here will keep you going, while their alcohol helps fight the nip in the air. Nothing like kebabs off hot coal on cool wintery nights; head to their Terrace bar for cocktails and canapés, desi style. The outdoor section of this Gurgaon microbrewery features a faux-graffiti wall, perhaps as an ode to the beer motherland. Head here on Friday nights for a Bollywood dance off! Their appetisers and bar snacks are great, too. If it’s one thing you do here – grab a table on the deck, just inches above their shimmering expanse of mashaal-lit blue pool. The food’s pretty great too. Gravel at your feet, trees between brick tables and benches, and a wooden fence make for a bucolic setting. A pleasant outdoor space with ample room for a large lunch group, makes Roots a favourite on our list. Though the indoor space is a nice space to relax in itself, Downtown has a cozy rooftop and microbrewery. With those two how can you go wrong? White umbrellas, high chairs and round tables are accompanied by a view overlooking the market. This on point Indian restaurant also does another great justice – their kitsch interiors. As for space, it isn’t very open, so children cannot run around, but they can entertain themselves with the truck facade, and knock back their range of colourful mocktails. And parents, cocktails for you! Staying true to that Indian hospitality, the staff and management welcome children, are super friendly, and will go out of their way to accommodate food allergies and preferences. Anyone who has been here knows it doesn’t matter how hungry you are; With the amount of food they plough you with, you won’t have time to notice anything else. That said, the staff is super friendly, pays attention to kids (if you have any with you), and if you want something specific and customised, they’re happy to come through. Children and chocolate. No prizes for guessing why your child will be nothing short of happy over here; all kinds of dessert, fondue, chocolate shakes, hot chocolate, and even chocolate pizza. Make sure you’re in big open spaces after this meal, we don’t need to tell you what sugar does to a child. American diner-esque, with an incredibly child-friendly menu, including shakes, fries, burgers, hot dogs and ice cream sundaes; blame it on pop culture, but there’s something about all-American joints that give them everlasting appeal. Maybe the words ‘dedicated Kids Zone’ should tell you all you need to know about how child friendly this spot is. Although it doesn’t really matter. Given the tropical rainforest theme the entire restaurant follows, the entire space is super for children. Special mention to the underwater themed section, in case the forest gets too much. Also, parents, they have a 7 course buffet meal available, so you have much to keep you occupied as well. Sigh, we love this restaurant. They never disappoint. Blame it on that age old ‘Family’ restaurant concept, or just good ol’ Indian hospitality, but the staff is very amiable, and patient with children. The only drawback – it is most definitely a sit down spot, so areas to run around are few and far between. The plus? It is in a hotel, so if push comes to shove, a walk outside by the pool is just a hop, skip and a jump away.